Coming in at number 22 on our top prospect list is outfielder Mason Williams. Once listed as the top prospect in the Yankees organization by Baseball America, Williams has seen his stock decline due both injury and the rise of his contemporaries. During two very brief stints with the Bombers in 2015 and 2016, Williams showed an impressive poise. He's solid defensively, and can hit for average. Unfortunately for Williams, the Yankees have some depth in the outfield so he likely won't become a full time player with the Bombers. With Clint Frazier, Blake Rutherford, and Aaron Judge presenting much more upside than Williams, he finds himself much lower on the totem poll. Even if he doesn't make the roster out of Spring Training, and he likely wont, I wouldn't be surprised to see Williams in the Bronx as a fourth outfielder at some point this season due to the injury histories of the starting outfielders. Drafted in the fourth round by the Yankees in 2010, Williams was once viewed as a player with the potential to become a force for a team that happened to be bereft of young talent at that specific juncture. Though Williams has been with the organization for almost seven years, he is only 25. Williams is capable of competently playing each outfield position so he provides the Yankees with some comforting depth in the event of an injury to one of the starters. Williams has put up respectable numbers throughout the course of his minor league career. In 506 games, he has 23 home runs, 180 RBIs, 99 stolen bases, and a .710 OPS, all while hitting .275. While his overall minor league record seems to indicate that Williams should have the raw talent to make it in the majors, the signs as of late have not been too promising. After suffering some injuries in the outfield during the 2015 season, Williams had a golden opportunity to make an impression with the Bombers, and even win a starting job for a few months. In eight games, Williams went 6 for 22 and even had a home run and three RBIs. From my recollection of watching Williams, I was quite impressed. He soon suffered a shoulder injury that would cost him the rest of the season. It would be fair to identify this injury as the potential conclusion of his chances to become a long-term fixture with the Yankees. After recovering from his injury, Williams spent most of the 2016 season in the Triple-A. In 31 games, he hit for no power and stole only one base, but his .296 batting average was a rather encouraging sign. In 12 games with the Bombers, Williams had eight hits in 27 at bats. Williams has never been a power hitter, but his inability to pick up where he left off on the base paths is a bit alarming. Aside from his average, Williams did not really stand out. Williams has not yet been given an opportunity to showcase himself in the majors, and it may not come with the only organization he has ever known. Heading into the 2017 season, the Yankees view Williams as an insurance policy. With Brett Gardner, Jacoby Ellsbury, and likely Aaron Judge starting in the outfield, the Yankees are pretty set. Tyler Austin, who will be competing with Greg Bird for the first base job, could also see himself getting some at bats from the corner outfield spots. Joe Girardi's infamous man crush, Aaron Hicks, is the favorite to win the backup outfielder spot. Though Clint Frazier and Blake Rutherford are more highly regarded prospects, neither is major league ready at this point in time. Should the Yankees suffer an injury in the outfield, it is very likely that Williams will be the first call up. Williams' fall from potential future star to defensive replacement has been pretty depressing to watch as a Yankees fan. Barring multiple outfield injuries, I can't imagine a scenario in which Williams can get an opportunity to get a lot of playing time in the majors. If he does see the majors in 2017, it will be as a fourth outfielder to fill in due to injury, or September call up, whichever opportunity arises first. Williams stock is as low as it has ever been since being drafted by the Bombers so a trade is unlikely. I foresee the Yankees stashing Williams away in Triple-A, and hoping he can undergo some sort of resurgence. If he can become the player he is capable of being once again, he may evolve into a valuable trade chip. 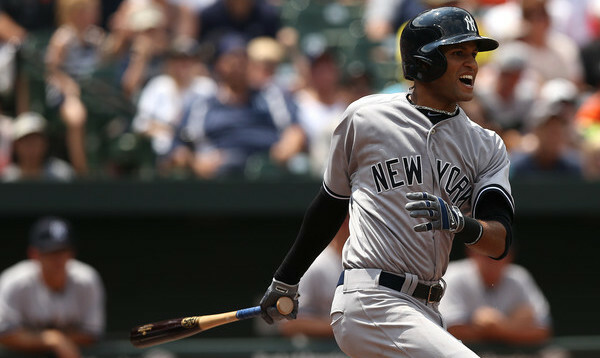 At this point in time, however, Mason Williams is nothing more than additional depth. I'd be shocked to see him on the roster come opening day.